The Prompt for File or Directory action enables you to ask the user to specify a file or directory during your build. 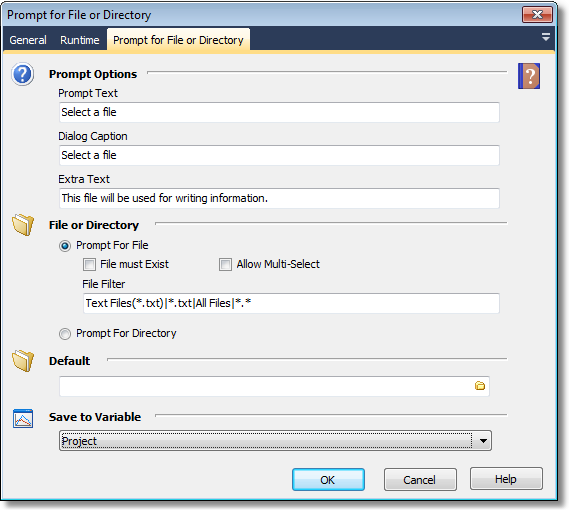 The file or directory specified is saved in a variable so that it can be used in subsequent actions. For more information on variables, including creating your own project and user variables, see here. Note: This action should not be used in unattended builds as it will cause them to hang waiting for user input. By default, interactive actions are not available from FinalBuilder console. Interactive actions cannot be used inside Async Action Groups.